Terry Pratchett’s five Tiffany Aching novels, a subseries of his Discworld fantasy novels, are written for a younger audience. The heroine, Tiffany, is nine at the beginning of the first book and ages about two years between volumes, being in her late teens in The Shepherd’s Crown. As seems typical with this sort of series the first three books are intended for a young audience, but become more mature as Tiffany ages. 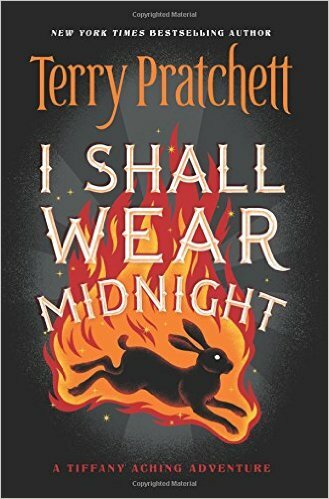 The fourth book, I Shall Wear Midnight (Tiffany is fifteen in this one), hits a decidedly darker note and I’d be hesitant to share it with many younger readers because of the much more serious themes and subject matter. At the heart of the novel are two deaths, that of an unborn baby by violence and that of an elderly man, dying a painful natural death. And those two deaths raise questions about justice and mercy and respect for life, good questions, deep questions, even if not all young readers will be ready to deal with the darkness. Tiffany is a young girl with a talent for witchcraft, which in Pratchett’s world does not exactly mean merely having a talent for spells and potions and charms like in Harry Potter, but more of a talent for seeing the world as it truly is, for seeing deeper meanings, for seeing people as they truly are and for understanding what makes them tick. Additionally Pratchett’s witches must demonstrate a willingness to selflessly put their gifts at the service of others. In I Shall Wear Midnight we see Tiffany, having finished her apprenticeship, stepping into the role of witch for her home community and really living out the service to others. In the first chapter we see her at a village fair where we get a hint of the themes that will follow, Tiffany is alone, apart because of what she knows and what she does, because as a witch she is present at births and deaths, at marriages— the liminal areas when lives change dramatically— and most of all because she has secrets, she is entrusted with many of the secrets of the community. In the second chapter we learn about one of these dark secrets, a nightmare begins and Tiffany is in the middle of it. A thirteen year old girl named Amber Petty has been beaten severely by her father when he found out she was pregnant out of wedlock. The beating killed the baby and the people of the village are ready to administer mob justice but Tiffany rescues him and forces him to flee from the “rough music” (the sound of anger, the sound of people who have had enough) because she doesn’t want the villagers to be guilty of his murder. But first she inflicts upon him all the pain which she had magically taken away from his daughter. Later, Tiffany attends the Baron at his sickbed, taking away his pain at a great personal cost to herself, she says that she’s not supposed to feel the suffering she bears, but really she does feel it, she is just able to deal. But after he dies she is accused of his murder and she is also accused of theft and of having kidnapped Amber, stolen away with her baby, and interfered wrongly with Amber’s family. In reality, Tiffany buries the baby and takes Amber to shelter for a time with the magical Nac Mac Feegles, rogue fairy folk who live in an ancient burial mound in the hills. She knows the fierce Feegle warriors will offer Amber physical protection and the wise kelda, the matriarch of the tribe, will help her to heal with her magical soothings. Mr Petty exhibits extreme remorse when he realizes what he has done. In repentance he picks a bouquet of nettles and places them near the body of the baby while Tiffany is taking Amber to the Feegles. Then he tries to hang himself. Tiffany returns to the barn to bury the baby and finds him just in time, hanging from the rafter with a candle set in the very dry straw near his feet. Despite her anger toward him, her conscience, and the sight of the nettles, pricks Tiffany, goading her into action, and she cuts him down, inflicting some bruises and broken bones in the process. She had no option, no option at all. She had to give him breath, for the sake of a handful of nettles, something inside the wretched hulk had still managed to be good. It was a tiny spark, but it was there. And there was no argument. What seems really incredible is that by the end of the novel Amber has reconciled with her parents and appears with them at the new baron’s wedding. It feels very sudden. How could she not only forgive her father for hurting her and killing her child but return to her home, seemingly content to let go of all the pain? Even taking into account the kelda’s magical healing and the tiny spark of good that Tiffany sees in Mr Petty, it’s hard to fathom, hard to understand how she could heal that much that quickly and how forgiveness could be possible, especially as we are not allowed to see any process of change on Mr. Petty’s part. The only nod toward his transformation is the sheepish look on his face and his well-groomed appearance. But if you read carefully, you can see that Pratchett does indeed lay the careful groundwork to make the reconciliation narratively satisfying even if our emotions might want to cry out for revenge and grudge holding rather than mercy and understanding. In fact, understanding is the key to Pratchett’s dramatization of mercy and forgiveness. Understanding in the novel is embodied in Amber’s almost magical gift which is somehow awakened during the kelda’s ministrations. Over and over again Jeannie tells Tiffany and the reader that there is something very special and necessary about Amber’s gift. Look at it, her words tell us, look closely and then look again. Here is the answer you’re seeking. Before Amber’s gift of understanding can awaken, she must first be healed. Jeannie the kelda employs the Feegle magic of the soothings, which is much more potent than anything Tiffany’s witch magic can marshal. Tiffany can only take pain away for a short duration, she cannot effect this kind of deep and total healing. Yes, the Feegles are a species of fairy, yet even so there’s something supernatural, even by Discworld standards, about the soothings. The soothings seemed to settle peple down an make them better from inside their head outward. They made you well and, best of all, they made you forget. Sometimes, it seemed to Tiffany, the kelda talked about them as if they were alive– living thoughts, perhaps, or kindly creatures that somehow took away bad things. Living thoughts, kindly creatures. There’s something rather angelic about the soothings, isn’t there? Something that breathes of the divine. You might say they even resemble the work of supernatural Grace. When Tiffany wakes after a night with the Feegles she finds Amber laughing like a baby as she watches the young Feegles playing and romping: “The laughter was younger than Amber was; it sounded like the chuckle a baby makes when it sees shiny things in pretty colors.” Amber has, in a sense, regressed to infancy, a preverbal stage of delight and innocent joy in merely being. Perhaps it is this healing that unlocks Amber’s gift of understanding of the meaning of things? The kelda says that Amber is “coming back into herself now, right from the starts, and that’s the best thing.” I’ve been pondering what it is that she means by “right from the start”. That plus the baby-like laughter make it seem like Amber is being given the chance to experience the wonder of a childhood that is not marred by fear and dread, she’s being given a sort of new start, a chance to heal not only her body and mind and soul, but also her memories. The rest of us are stuck with the childhood we had, but Amber is being given this very precious thing, a chance to reclaim the childhood which had been stolen from her, stolen by her father’s drunkenness and by his suspicion that Amber is not truly his daughter, which lead him to great cruelty, and stolen by both her parents’ lazy fecklessness which is unable to do the things that make a house into a home, simple housekeeping and gardening, and adding human touches to their residence and to their lives. 1. First, removal from the situation to a safe place of healing and Amber’s regression to babyhood and wordless laughter. The supernatural presence of the soothings, a sort of angelic presence. 2. Then, Amber’s gift of understanding, not only of language, but, as the Toad says, “she understands meaning.” And as the kelda says, “She must ken the meanings in her head, and that’s magic, missy.” Amber’s understanding is a gift, the kelda insists. It’s something deeper, understanding perhaps of the mysteries of the kelda, which have to do with community, memory, seeing the way things really are at their truest heart. Or maybe just understanding the world itself? 3. Then, Amber’s violent rejection of the idea of going back home to her violent father. The first time Tiffany tries to take her home, she just screams wordlessly and bracing herself so that she cannot be moved. A primal, almost animal rejection of her family. Later, she verbalizes her rejection: “Ye willna get me back to that place… and ye can stick it where the monkey put his jumper!” and expresses scorn at the idea that her father misses her, “Oh, aye, and if the old scunner misses me, he’ll aim another blow!” And she sneers when Tiffany suggest that she can make her father change, “Sorry mistress, but Jeannie told me you were clever.” It is so important that Amber be able to articulate her separation from her parents. Freedom would seem to be a necessary foundation for true mercy and forgiveness. If Amber does not know and understand that she is free from her father’s coercion and control, if she is not free to reject him, she is also not truly free to forgive him. And it strikes me as I think about that how appropriate Amber discovered her essential freedom among the Wee Free Men. “Nac Mac Feegle! The Wee Free Men! Nae king! Nae quin! Nae laird! Nae master! We willna’ be fooled again!” The Nac Mac Feegle know what it is to escape oppression, to fight for freedom from a monstrous situation of slavery. Eventually Amber is able to come to see her father as a person rather than a monster or force of nature. But first she must see and acknowledge the evil he has done. 4. After Amber has refused to go home, Tiffany brings her before the Baron. She stands up for Amber before the Baron and insists she will bring Amber to her own home. Justice is acknowledged. And Amber’s independence from her family is, in a sense, ratified. 5. Tiffany takes Amber to her own house where she re-integrates into human society, into the Tiffany’s healthy family. Tiffany’s parents accept Amber with the same radical unconditional love they have always had for Tiffany. Their love has to be healing for Amber as well. She needs to experience life in a normal, functional, healthy human family before she can face her dysfunctional family. She needs a model of what that looks like and feels like, even if her sojourn with the Achings is brief, I think it too is transformational. Later in the book the recurring vision of the hare and the fire comes true as Tiffany jumps through a fire. Perhaps not only is Tiffany the hare that runs into the fire that doesn’t burn her, but so is Amber. Going home is running into the fire. And it doesn’t burn her because she’s not trapped in the fire, she has an exit, her tailor fiancé . She runs through the fire and is not harmed. She doesn’t want him to get into trouble? Note that word again, understand. What is it that Amber understands? Is it that the soothings have been helping her? That they have made her memories fuzzy? Or is it something deeper, more profound? Is “I understand” more of an ontological statement, a declaration of what the soothings have done for Amber, the gift they have imparted, the transformation they have wrought? Fundamentally, Amber is now one who Understands. I think there is at least a hint of that in Pratchett’s use of the word. But supposing you meet your dad? A day as a pig might help him mend his ways thought Tiffany. But there was something of the kelda in the way Amber had said, ‘I’ll understand.’ A shining light in a dark world. Understanding again. Amber is not saying that she understands that is a possibility she will see her dad. She’s using the future tense. “I will understand.” She will understand her dad when she meets him? Here it is clear that Pratchett means us to look more closely at that word because Tiffany too sees there’s a magic in it. Something of the kelda. The word points to an inner power. And from other novels in the series we already know that part of the power of the keldas is being able to enter a stream of shared memories, to commune spiritually with all the keldas of the past and the future. Is Amber also partaking somehow of that power of communion, but turned outward to other people? You couldn’t imagine the Duchess delivering a baby in that dress. . . . Tiffany blinked. She could imagine the Duchess doing it if it was an emergency, she would. She would bully and complain and order people around, but she would do it. She was that kind of person. Tiffany blinked again. Her head felt crystal clear. The world seemed understandable but slightly fragile as if it could be broken, like a mirror ball. And in that moment Amber greets Tiffany and her parents are behind her, her dad is “scrubbed and sheepish and also quite bashful. That word again, understanding. That seems to be the key to healing broken relationships here. Amber’s gift and maybe Tiffany’s too? Amber’s dad is described as scrubbed and sheepish, a sign he’s at least changed outwardly. Interesting the choice of the word “sheepish.” That can’t be accidental. Her dad is like a scrubbed sheep. What are sheep like? Sheep are stupid. Sheep need a shepherd. Is Mr. Petty the lost sheep come to rejoin the flock? Also, it seems noteworthy that her parents are following Amber, not vice versa. She’s leading them. Leading them into the funeral feast, come to think of it. Ready to bury the past with the old Baron? Also, a little note, I think it’s not quite clear that Amber is going back to live under her parent’s roof. Except for the bestowal of her dowery and the final scene, year later, where a married Amber presents Tiffany with a dress made by her tailor husband, Amber is dropped from the story and we learn no more of Mr and Mrs Petty. But even if she does move back home, she’s no longer a minor under her father’s power, not emotionally and not in the eyes of Tiffany and others in the village. I think that much is clear. She has power of her own and a place to go, means to thrive without them. She can go to Tiffany, she can go to the Feegles. She’s stronger, connected to the community, who, by the way are now resolved to be involved, to be watching, to take care of their own, to not let things get that bad ever again. For Amber, at this point, home is a way station. She’s going back home, if she does go back, to get married, to start her married life, with her parent’s blessing, perhaps, but no longer needing their approval. They have no more power over her. With Amber’s gift and her reconciliation with her father, Pratchett definitely seems to be pointing us to a mystery. To the mystery of understanding which is the ground for true reconciliation and for mercy. Not superficial understanding, but perhaps the deepest understanding, to understand another person’s soul? Perhaps to understand someone truly is to love them? To wish for their good. Certainly without it, it’s hard to imagine peace. Special thanks to my sister, Theresa, for asking the question that inspired this deep reading and analysis. Thanks also to Kate and Nicole who helped keep the conversation rolling and added their own nuggets of insight. Lastly, thanks to Mandy, who pushed me to read the Tiffany Aching books in the first place.